After a whirlwind couple of days by the beach (more about that later) it was back to reality last week, and a cold snap in Brisbane. As I type this I’m intermittently warming my hands on a cup of tea, because I don’t deal well with the cold. It seems I really have acclimatised to living in Brisbane, after growing up in the much colder Tasmania, because I really do feel the winters here now. Extra blankets now sit on top of the bed as I try to keep warm at night. There are two things I love about winter however. The first is my wonderful husband getting in and warming my side of the bed at night, as I wash my face and brush my teeth before bed. This act makes him the best husband in the world, in my opinion. 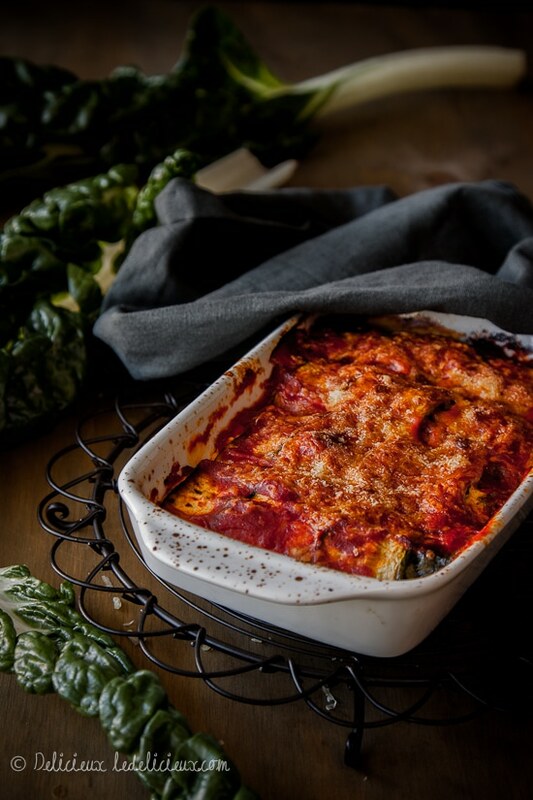 The other is warming and comforting winter food, such as this Zucchini Cannelloni. When I was grocery shopping the other day I came across some huge zucchini (courgettes) and was struck with what I thought, at the time, was the brilliant idea thinly slice the zucchini lengthways and use it to make cannelloni. But, it seems, according to Mr Google, someone else thought of it first. No matter, I still think it was a moment of genius, and I’m sticking to it. While I’ve used zucchini here you could equally use eggplant, sweet potato, or even pumpkin. They would all be brilliant, and make for a much healthier alternative to pasta. 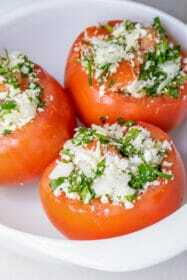 Simply grill and fill with the ricotta mixture and top with sauce, grated cheese and bake. I’ve used Tomato Passata here to top the cannelloni, however feel free to use your favourite pasta sauce. Finally, I’d like to congratulate Tracey Mackie, who was the lucky winner of my KitchenAid Artisan Hand Blender give away. Tracey has chosen the beautiful Almond Creme Hand Blender as her prize. Congratulations Tracey! 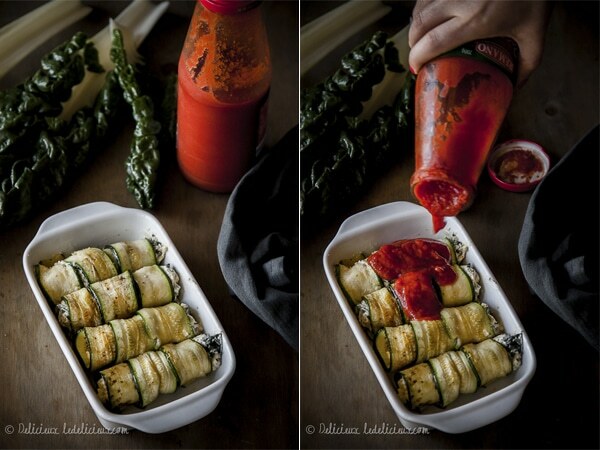 Zucchini cannelloni - A delicious alternative to the usual pasta based cannelloni. Thinly slice the zucchini (courgettes) lengthways using a mandolin or knife. You want the slices relatively thin (approximately 5mm), but thick enough that they won't disintegrate when cooked. Heat a non stick frying pan over a medium low heat. Add some olive oil to a piece of paper towel and rub over the frying pan to lightly grease. Cook the zucchini on each side until cooked and lightly browned. Place on a plate to cool while you cook the remaining slices. Once the zucchini is cooked add olive oil to the pan and add the onion and garlic, and cook until the onion is soft. Add the silver beet stalks and cook until softened before adding the leaves. Cook until the leaves are wilted. Add the lemon juice. Leave to cool. Preheat the oven 180 celsius (350 Fahrenheit). 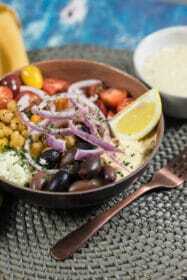 Place the ricotta in a large bowl along with the 1/2 cup of cheese, herbs, nutmeg, silver beet, onions and garlic. Mix to combine and season to taste. Take 3 slices of zucchini and lay on a chopping board lengthways so that they are slightly overlapping. 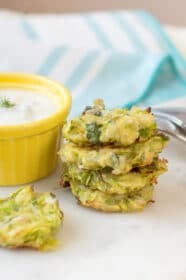 Take a spoonful of the ricotta mixture and place along the short edge on the zucchini and roll up the zucchinni to cover the filling. Place in a lightly greased large (20cm x 28cm) baking dish. Repeat with the remaining mixture. Top with the tomato passata or pasta sauce, if using, and top with remaining cheese. Bake for 20 to 25 minutes, or until the cheese is golden. 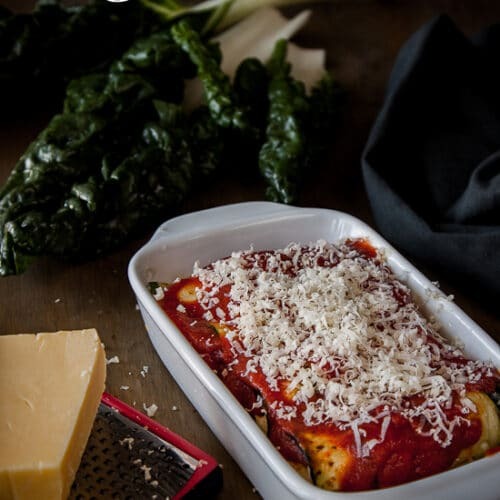 The cannelloni can be prepared up to 1 day ahead. Top with the passatta and cheese just before baking. What other cheese could be used instead of cheddar? You could try parmesan, but I would mix it with some mozzarella so that it melts better. It IS zucchini! OMG! This looks incredible! It’s like….carb-free-art!! This looks seriously good, I don’t think I’d even miss the pasta! This sounds perfect for when the weather gets cooler, And I have to agree with you, husbands make great bed warmers! 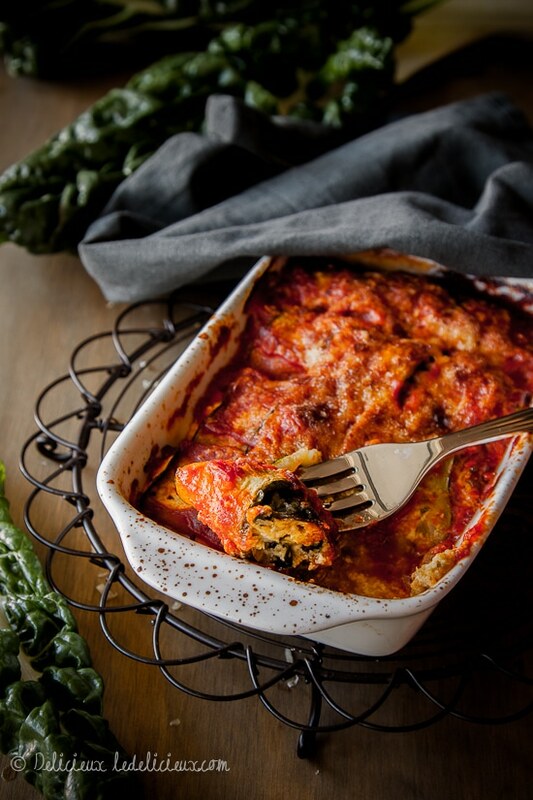 We often make lasgne with zucchini but I am definitely going to try your beautiful canelloni next time for a bit of variation! They look soooo tempting in this weather. I agree. Your husband deserves an award, that’s so sweet! Now I think I could eat this everyday. This looks great! This just looks insanely delicious!! Wow! Even if you weren’t the first to think of them they still look delicious Jennifer! Great alternative to pasta. aaw aren’t we lucky wives. I am like you, and I don’t deal with cold very well. My husband does the same for me during winter and he always gets extra kisses for that 🙂 As for the zucchini cannelloni – love the idea! I love cannelloni and love that you used zucchini instead of pasta. Very clever and it looks delicious! Lovely post. I’m happy to give you credit for this 🙂 It’s beautiful! 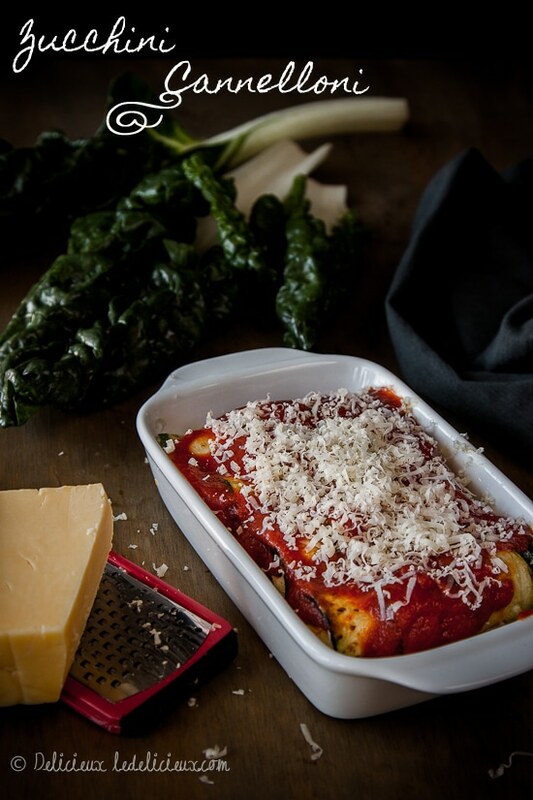 I love cannelloni, this is such a delicious and nutritious spin on a comforting meal! A wonderful idea! That dish looks mighty scrumptious and irresistible. Delicious! I love a good vego canneloni, especially one that has extra veggies in it. I make cannelloni with super thin crepes as an alternative, but I’ll have to try this out. 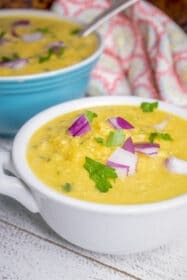 I’ve used veggies instead of lasange sheets before too – nom nom nom…. Cute hubby, you’ve got there, mine does the same for me, so thoughtful. I love the crepe idea Jas. I’ll have to try that 🙂 And I’m glad I’m not the only one with such a thoughtful hubby. Gotta love them all the more when they do things like this. I hope you enjoy it Jenny 🙂 I’m already planning on making this again, it really was delicious, and felt much lighter than the pasta version. Very nice idea and a clever way to slip another serve of veggies into a meal. My kids will eat almost anything if it has cheese on top.